Not much to look at, right? Wrong! 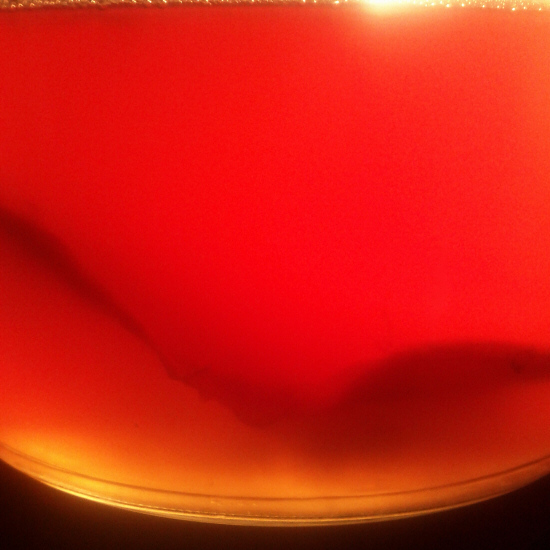 I spent a good FIVE MINUTES staring at the kombucha tea mother, gently swirling and undulating right after being placed in its tea-and-sugar bath, the watching-chickens effect. I like the look of the mother, although some people find the whole thing kinda…icky. If you’re not familiar, this is a sparkling drink, tartly acidic and slightly sweet, made by floating the mother—it’s also called a SCOBY, symbiotic colony of bacteria and yeast—in a solution of tea (black or green or both) and sugar. Let it ferment for around a week and a fizzy beverage is the result. It’s quite impressive. Not surprising, there are all sorts of magical health benefits ascribed to kombucha tea, and from the bit of reading I’ve done, none of it is really “evidence-based,” to use the popular medical description for stuff that’s scientifically proven, whatever exactly that means. In any case, nobody really says it’s BAD for you, maybe it is magical, and I find it…refreshing. Making it is easy: 4-5 tea bags in some water for a few minutes, top up the hot tea with cold water to about 3/4 gallon (around 3 liters) so it’s all cooled down, then plunk in your SCOBY—any size will do, it grows!—along with a cup or two of kombucha tea (you store the mother in the tea), and you’re done. Cover with a clean cloth to let in air but not dust, stash in a warm, dark place, and taste test in five days or so: if it’s too sweet, leave longer, if it’s too tart (the main bacterium makes acetic acid, which is basically vinegar), well, test earlier next time. It’s all pretty loose and easy, and each batch you get a new, extra mother that you can pass on. Do a search and you’ll find lots of details. My first mother I was given in a jam jar at a raw food talk, and I made kombucha steadily for a couple of years, for no reason other than that I like it (many people refuse to even taste it?! )—after a couple years off, I’m back in production. Yet another thing to grow! My family’s experience with kombucha has been quite positive, however I can’t recommend buying a dehydrated starter. We’ve tried twice, and failed each time. Note also that most commercial formulations have quite a bit of fruit juice or some such mixed with them, which mutes the taste and dilutes the alcohol content. As for the alcohol content, I’m not clear exactly how the commercial kombucha companies fixed that, maybe we’re getting…pasteurized kombucha now? Unlike raw vs pasteurized milk, where raw can be like climbing mountains to find if you want it, you can still make good ol’ raw kombucha with ease, and that’s kinda cool. My experience with it has also been quite positive. My one claim is that I find it tasty! As usual, informing yourself and coming to your own conclusions is a good idea! !